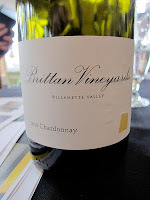 Brittan bought the fruit from Willamette Valley growers and made the wine, but not without difficulty. "It got stuck in fermentation and I got tired of waiting for it," he says. "I figured it was a wedding wine so I bottled it anyway, a little sweet." "Well, she kicked the guy to the curb," Brittan says. "And I had two barrels of Chardonnay. But that's OK, I never liked that guy." Appropriate, as he didn't like the slightly sweet Chardonnay either. "My wife was out trying to sell 45 cases of it and people were throwing dollar bills at her, trying to buy the sample (bottles)," he says. "If you want to sell Chardonnay, it's a good thing to make Rombauer Chardonnay." Brittan Vineyards Willamette Valley Chardonnay 2010 ($40) was one of the best Chards I had last week in Oregon: intense with plenty of citrus fruit initially, it gets broader on the finish. Richness at the bottom, freshness on top, 13.5% alcohol: I hope I get to try this again in 5 years, but I rate it 93 points now. He only made 200 cases and once again there's a daughter-related reason I got to try it. So how's your daughter doing, Robert? "She's doing OK. She's got a new boyfriend. I don't like him, but I didn't like the first one either. But my second daughter, she's a viticulturist. She got married to a great guy, but he's not a wine drinker. He and his friends are all beer drinkers. We took 20 cases of wine to the wedding and brought 19 back." If Brittan's daughters ARE reading this, sorry for the embarrassing anecdotes -- but thanks for the Chardonnay. Yeah, I don't know about Robert as a father-in-law---but at least you'd know where you stood! Where do ya buy this stuff----winery direct? Where in Orygun are these vineyards? There's not a lot of it but I know they have some for sale, so I'd email the winery. 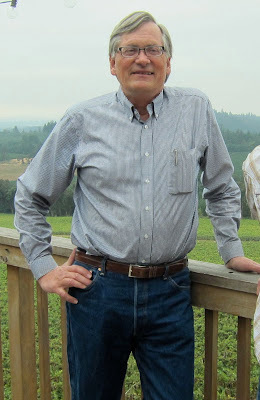 Vineyards are in Willamette Valley, he may have told us the specifics but I didn't write them down. Maybe he'll jump on here and tell us. You never know.